Everyone knows that dog is man’s best friend. 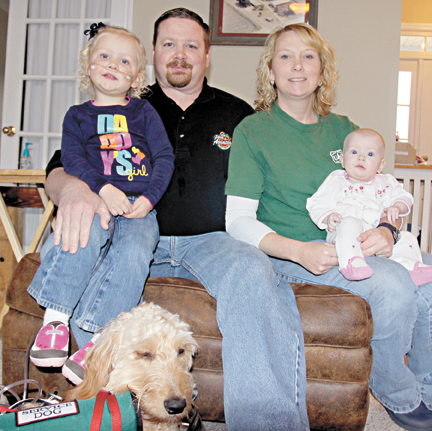 For 2-year-old Alida Knobloch, her dog Mr. Gibbs is more than just a friend, he’s a true life-saver. Knobloch has a rare disease called neuroendocrine hyperplasia of infancy, a disorder which occurs in children. People with NEHI have a condition in which diseased portions of the lung filter oxygen through extra layers of cells, making it harder for the afflicted to breathe properly and get enough oxygen into the lungs. Due to that, Alida is attached to an oxygen tank almost constantly, taking time off the tank only for tasks such as bathing. And that means any jaunt to the park or trip to the playground requires the little girl to drag around an oxygen tank, either in a small backpack or attached to a cart built by her father. Alida’s parents, Aaron and Debbie Knobloch, wanted to do something to help their older daughter navigate life despite having a tube trailing her at all times. So Aaron and Debbie, a nurse at Gwinnett Medical Center, began to look into acquiring a dog which could carry the tank for Alida and follow her in her everyday activities. It wasn’t the easiest task. Most service animal groups work based on need, meaning Alida could sit on a waiting list for years, and the Knobloch’s felt uncomfortable trying to take a fully-trained animal that could otherwise go to people with more serious conditions. So the family looked into private trainers, finally settling with Loganville trainer Ashleigh Kinsley, who was able to provide them with 1-year-old Mr. Gibbs, who had been trained since a puppy. 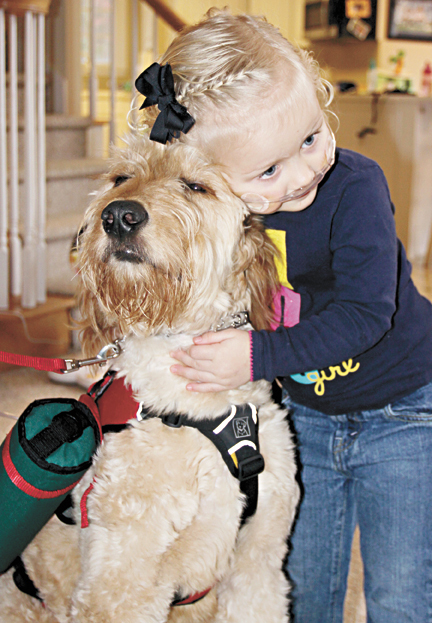 When Mr. Gibbs is put in the red service animal vest, which has pockets on either side for small oxygen tanks, he follows Alida everywhere, providing a lifeline between her and the supply of air she needs to breathe properly. Of course, even a playful dog can struggle to keep up with an active 2-year-old, but the Knoblochs say it’s going well so far. Mr. Gibbs is trained to follow her in any situation, climbing up playground equipment and going down slides with her, and he follows orders well, though the challenge is to ensure Mr. Gibbs takes Alida as his primary person. Every order the family gives, Alida has been taught to echo, and the dog is starting to accept her as his charge. The family plans to really put Mr. Gibbs to the test soon on a family vacation to Disney World. And things are looking up for Alida. While she will always have NEHI, her lungs are developing normally, so eventually she will have more healthy lung tissue than diseased and could wean off the oxygen tanks occasionally. The move to Georgia in her infancy helped as well. Debbie Knobloch said having Mr. Gibbs should help greatly. Alida is simply happy to have Mr. Gibbs around, running happily around her canine helper and tugging him along on her adventures. “He’s my best dog,” Alida said.